Op 15 Maart 2017 werd in het Academiegebouw van de Universiteit Utrecht een symposium georganiseerd met als thema ‘Advancing Research into the Sharing Economy’. Wij waren aanwezig om de presentaties op video vast te leggen, om ook zo de resultaten van deze interessante academische onderzoeken met een groot publiek te delen. 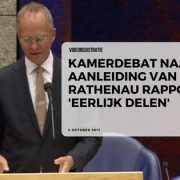 De rest van dit bericht is, vanwege het internationale karakter van het event, in het Engels. This study examines which linguistic features in online profiles of sellers in the sharing economy predict their perceived trustworthiness. In the sharing economy consumers directly transact with peers mediated via an online platform. They are typically strangers to each other and little information is available about both of them and the product or service involved. Therefore, establishing trust between a buyer and seller is a precondition for a successful transaction. One of the main sources to develop trust, from a buyer’s perspective, is the online profile page of a seller. An essential part of such a profile page is the textual self-description, because it conveys a certain, intended or unintended, impression of the seller. The aim of this study is to investigate the influence of linguistics on perceived trustworthiness of sellers in the sharing economy. Sharing platforms have raised controversy, in particular, because they claim that existing regulations in the markets they operate in, do not apply to sharing platforms and their participants. Hence, the platforms’ institutional strategy is to try to avoid the institutional logic of states (product regulation) and professions (licences, diplomas). Instead, platforms frame their business as belonging either to the new institutional logic of “tech” and the older institutional logic of the family (that is, the private sphere). Drawing on the theory of institutional entrepreneurship (Battilana et al., 2009, The Academy of Management Annals 3), this paper investigates these strategies for five platforms in The Netherlands (SnappCar, Airbnb, UberPop, Airdnd, Helpling), and explains why these strategies increasingly differ from one another and why all, so far, have been quite successful. We will also discuss some implications for possible regulations in the near future, in particular, discussing the pros and cons of granting platforms a “Right to Challenge”. New technology firms such as Airbnb, Blablacar, and Uber have recently spurred the advent of the Sharing Economy (SE), where participants routinely share commodities such as spare rooms, cars, and even food with fellow participants. Despite their societal benefits, SE platforms are facing resistance and protests in several countries. National governments and municipalities face a dilemma between not smothering this innovative phenomenon by excessive, ill-suited, and outdated regulation and protecting the public welfare from potential risks of sharing practices. This poses an urgent challenge about understanding different strategies that SE firms employ within and across countries to actively legitimize their products/services. This paper examines how SE firms attempt to gain legitimacy by shaping their institutional environment. This is the first cross-country, cross-sector study of SE to address the impact of firms’ society shaping activities on all key stakeholders. In-depth qualitative analyses of diverse socio-economic characteristics and infrastructural conditions in the Netherlands, the U.K., and Egypt contribute to our theoretical understanding of market emergence, firm entry strategies, and institutional entrepreneurship, as well as help policymakers about regulating SE in a welfare-enhancing way. The sharing economy is profoundly changing our cultural and technological landscapes. To provide social exchange at a global level, sharing economy companies leverage interpersonal trust between their members on a scale unimaginable even a few years ago. The mechanisms at work in enabling trust between strangers are not well understood. In order to counterbalance the natural tendency to treat trust as purely a byproduct of social affinity, i.e., homophily, sharing economy platforms typically employ some form of reputation system that extends trust toward more diverse others. We test this argument using an online experiment based on an investment game with 8,906 users of Airbnb, a leading hospitality company in the sharing economy. We vary demographic and reputation features to study the interplay between homophily and reputation. Our findings show that reputation systems can significantly extend the trust between dissimilar users who occupy broader distances in the social space. We also used real world data from one million interactions on Airbnb to confirm that our experimental results hold on the platform. We use these findings to discuss the role of reputation for building trust online. Carsharing provides an alternative to private car ownership by allowing car use temporarily on an on-demand basis. Operators provide carsharing services using different business models and ownership structures. We distinguish between cooperative, business-to-consumer (B2C) roundtrip and one-way, as well as peer-to-peer (P2P) carsharing. The study characterizes these different types of business models and compares their success in terms of diffusion using a comprehensive database of all 101 German carsharing providers in 2016. The key results hold that fleet size is significantly different across business models ranging from a few cars (cooperatives in small towns), to a few hundred (B2C roundtrip in larger cities), to over a thousand (B2C one-way in largest cities), up to multiple thousands (P2P across the country). By analyzing for each operator the number of cars per capita in the city they operate in, we do not find significant differences across business models indicating the viability of each separate business model type. Hence, we conclude that business models will continue to co-exist for a while, although some of the business models may well converge in the longer run due to Internet-of-Things applications and the introduction of self-driving cars.